Hi friends! I hope you're having a great day! I'm still sick. One of these days, I'll get better. Perhaps. Here's a card I made that I never got around to blogging. I used some Cosmo Cricket Evangeline for this one. I used the elements deck, papers, and stickers. 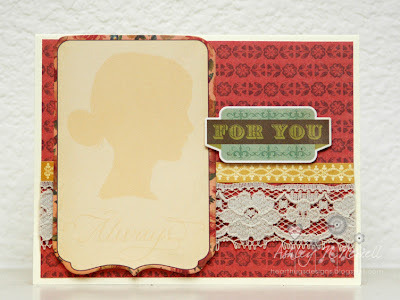 I used the creme vintage lace from Creating is Fun. This card came together super fast using all these elements. Beautiful! I love that lace. I could see this made into a scrap page too! Beautiful!